b. 17th November 1857 Ontario, Canada. d. 14th April 1908 Hong Kong. ‘The Dictionary of Hong Kong Biography’ listed below. Rennie arrived in Hong Kong in 1890 as sales representative for an American company Portland Flouring Mills whose principal stockholder was TB Wilcox. He went into partnership with Paul Chater and Hormusjee Naorojee Mody and persuaded them to invest in that became the Hongkong Milling Company. He also used his own money saved during his time the Portland Flouring Mills. He hoped to sell his flour in Hong Kong and China and especially to the buyers who had been his customers for the latter company. The HK Milling Company started production in January 1907. Hongkong Milling Company established a number of substantial buildings in Junk Bay (Ngau Mei Hoi). and installed the most modern equipment available. However, his mill failed and for a number of reasons. There was too large a capital investment and the mill was too big ( “a two thousand barrel mill”). There was no demand in China for millfeed, a byproduct which provided much of the profit for the American and Canadian millers. As a result Rennie try to use it to feed several hundred pigs most which died. Buyer’s in China remained loyal to Wilcox’s brands, therefore sales at the HK mill were slow. A cargo of Indian wheat introduced weevils into the mill and proved difficult to get rid of. Rennie issued false financial statements indicating large profits which caused considerable skepticism amongst those in the milling trade. As if the above wasn’t enough Rennie had been buying wheat in advance, which appeared a wise move as prices were rising. The price collapsed and milled wheat could be delivered to Hong Kong at a cheaper rate than Rennie had bought wheat for shortly before. 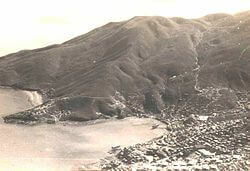 Rennie committed suicide on 14th April 1908 off Lei Yue Mun on his way by boat to the mill in Junk Bay. Apparently he did this by throwing himself overboard with a dispatch box tied to his neck. Another account suggests the box floated as did Rennie. A boatman was able to get to him with a lifebuoy but Rennie kicked him away. Rennies Mill enclave in the 1950s. There was a common misconception that Rennie had committed suicide by hanging himself at his mill. The Chinese name for Rennie’s Mill, originally Diao Jing Ling, meaning ‘Hanging Neck Ridge’, was later changed to the considerably more cheery if clumsy Tiao Jing Ling or ‘Ridge of Regulated Scenery’. This would be Tiu Keng Leng in Cantonese. And the latter is the name name given to the modern housing development after Rennie’s Mill town whose residents were strongly supportive of the Kuomintang cause, was demolished immediately prior to the handover in 1997. All rather confusing!